Was it worth it, I am not sure yet. Ask me much later. This scarf took way too long for my tastes. The pattern Henry, was simple and straight-forward. The problem was small needles, dark light weight yarn (Malabrigo sock yarn), and 500+ stitches per row. 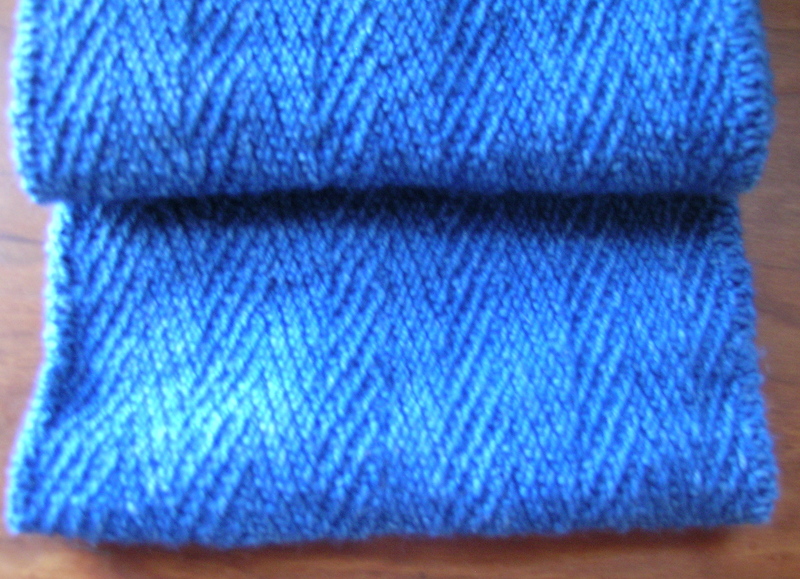 The end result is a very dense fabric that has the look of a woven scarf instead of a knitted one. I think that the pattern definitely appeals to men who shy away from wearing many overtly hand-knit things in public, especially with a nappy winter trench coat. The scarf is undeniably soft, and the drape of the fabric is wonderful. Mistakes are very hard to correct in this pattern. 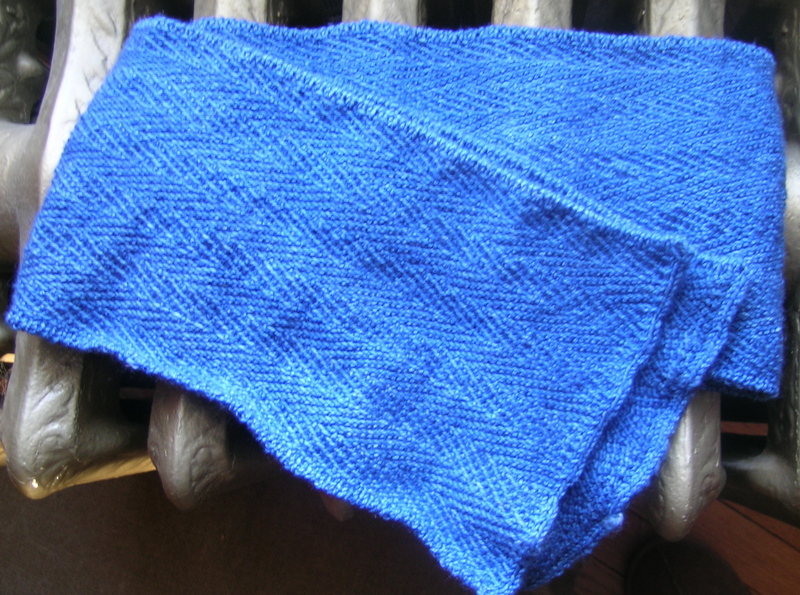 At one point I found that I had a mistake, and had to unknit several rows. That proved, by experiment, to be a better solution than taking the scarf completely off the needles. Whenever I finished a band of the herringbone pattern, I would show it hopefully to my husband and say: “Is this wide enough for a scarf for you?”. He would always hold up his hand, and I watched in horror as he spread his fingers wider and said: “just about this much more”. I finally put my foot down when the yarn was running out, and I would have had to search my stash for the 1/2 skein that matched this. I think that the size is good. If I ever considered making this again, it would not be with a sock yarn, and with bigger needles. I had issues with my thumb and left hand hurting whenever I worked on this for too long. Moral of the story: When you read on Ravelry about people taking one year to knit a scarf, take heed. I was very smug, thought I am such a fast knitter that I started this 2 weeks before Christmas thinking that I could finish it up for his stocking. I still need to block this, but it is cold, and my husband gave his scarf to a dear friend who was stranded here last weekend on his way to DC. He is wearing it as I write. Oh, dear! 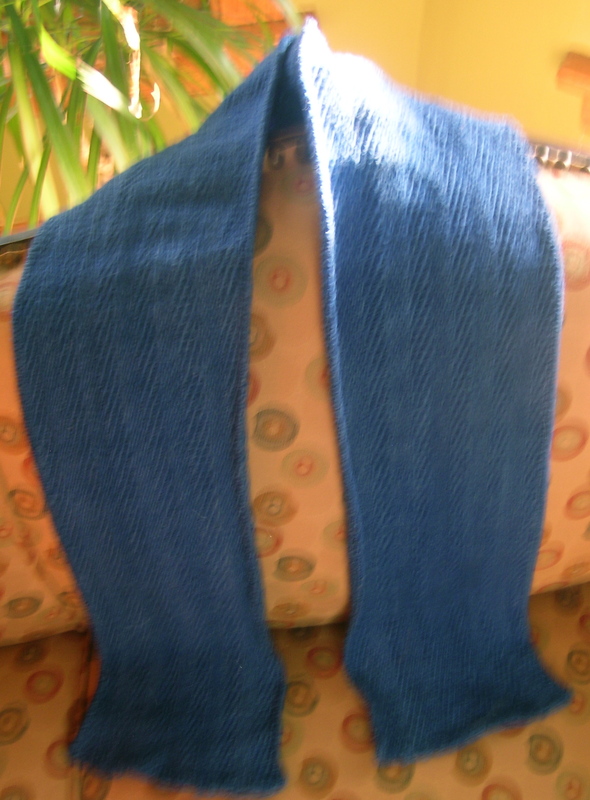 I just put in a sock yarn order to make this very scarf. You’re scaring me, here! You did a great job and it looks terrific. I hope mine turns out as nice.